Please note following details regarding severe weather warning currently in place in North Queensland. 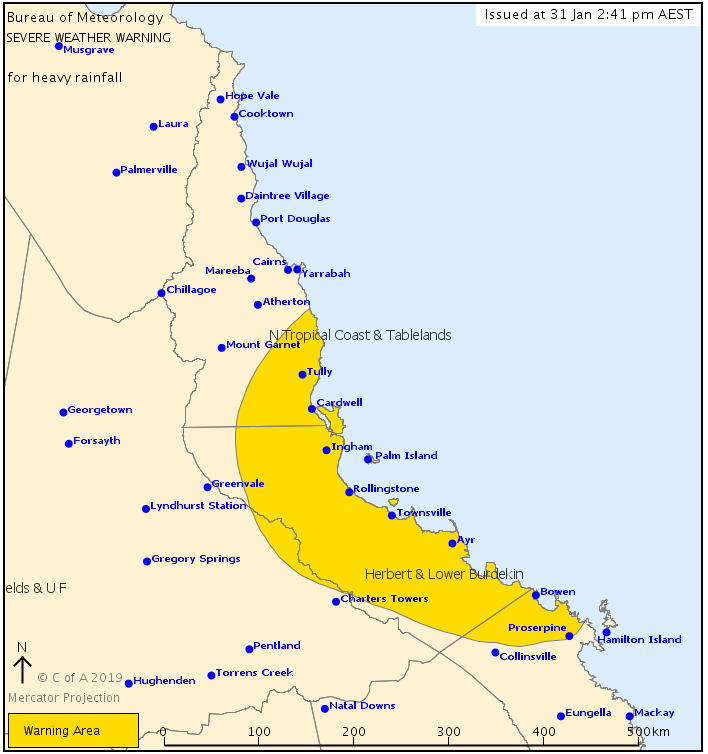 The monsoon trough is expected to remain slow moving across north Queensland for several days. Bands of heavy rainfall and thunderstorms are likely within the warning area through the remainder of today and Friday. Monsoon flow is forecast to increase across Cape York Peninsula on Friday and the weekend, which is likely to maintain or strengthen the monsoon trough. Rainfall rates have eased over the warning area in the past three hours. However there remains a high risk of redevelopment of heavy rainfall bands, with the potential to produce flash flooding, between about Townsville and Proserpine through the remainder of today, and this risk extends north towards Innisfail overnight and during Friday. Six-hourly rainfall totals between 150mm to 200mm are likely with this activity, with isolated heavier falls possible, particularly with bands of thunderstorms. Longer term, the re-strengthening of the monsoon trough over the weekend may lead to multiple areas of heavy to intense rainfall over already saturated ground between about Innisfail and Bowen, with the potential for particularly significant and dangerous flash flooding. Locations which may be affected include Innisfail, Tully, Cardwell, Lucinda, Ingham, Palm Island, and Rolling stone, Townsville, Giru, Ayr, Bowen and Proserpine. Please note that due to current wet weather conditions in Queensland’s North, Abbot Point Coal Terminal have suspended operations due to continued intense rainfall and the condition of product in the stockyard.